Trials 2017 is upon us this week, and 18 of our sailors head north to Ballyholme YC to challenge for places on various international teams. 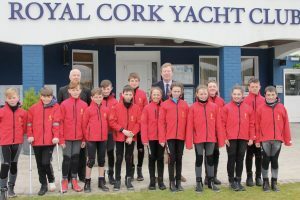 The sailors were presented with the traditional Trials Jackets by the Admiral, John Roche, in the presence of Rear Admiral (Dinghies), Stephen O’Shaughnessy who kindly deputised for the Class Captain, Ian Venner. 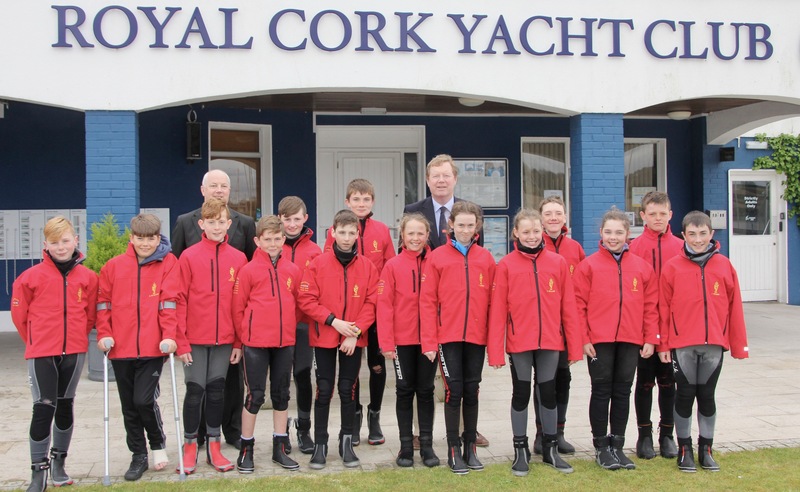 Club sailors heading to trials for the first time include Eva Spillane, Anna Keal, Simon Pritchard, Ciara Burns, Kate Horgan, Stephen Cunnane, James Dwyer-Matthews and Jamie Venner. They are joining some seasoned campaigners, including Rory O’Sullivan, Harry Pritchard, Cillian Foster, Richard McSweeney, Killian O’Regan, Michael Crosbie, Eoin Horgan, Patrick Bruen, Justin Lucas and Harry Twomey. We unexpectedly lost one Royal Cork sailor along the way – Jonathon O’Shaughnessy qualified for trials, but is eating too much Weetabix and has sized out! He started his Topper campaign this year and we wish him well. The event runs from Thursday to Sunday and you can follow proceedings on www.iodai.com . There are places on a European team, as well as two International Development Teams up for grabs, and some sailors have also opted to attend the Worlds if they meet the qualifying criteria. The jacket presentation took place during one of our Performance Clinics, where we had International Coach Diego Blatt leading the club team of John Durcan, Eoin Lyden and Peter McCann for a three-day clinic as well as the non-trials group who were coached by Rebecca O’Shaughnessy. Coaching continues next week for the non-trials group – next year’s superstars, no doubt! We wish all our sailors the very best of luck in what is always a tough event.